What is the NCLEX RN Mastery Simulation? How do I access the simulations? What is the difference between Pretest and Posttest? Can I take the simulations more than once? Can I review the questions and rationales? What does the “Probability of Passing” mean? How do I interpret my numbers? Will the NCLEX RN Mastery Program help me? Every nursing student knows the importance of the NCLEX. As you transition from nursing student to registered nurse, you have the opportunity to experience the NCLEX first-hand with our ONLINE simulations of the actual NCLEX Exam! Increase your understanding of the most important exam of your career when you take the NCLEX RN Simulation Exam and focus your studies on what you’ll need to know to pass. NCLEX Mastery’s NCLEX Simulation is an essential companion to the mobile NCLEX RN Mastery application, and it increases your confidence and ability by simulating the computer-based NCLEX examination.How do I access the simulations? If you are new to NCLEX RN Mastery, consider purchasing the NCLEX RN Exam Program: the web and mobile app and both NCLEX simulations or you can purchase each NCLEX RN Simulations separately. There is no mobile version of the simulations and they cannot be purchased through Google Play or the App Store/iTunes. 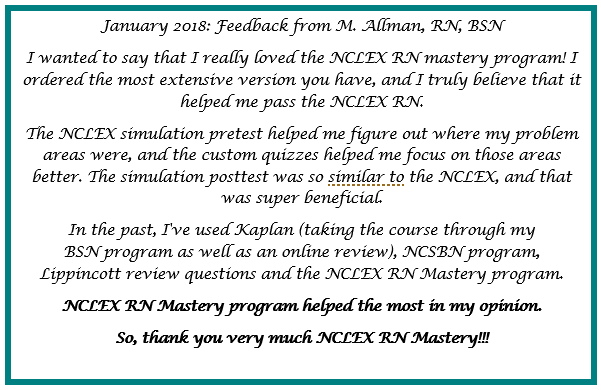 To access the NCLEX Simulation you must be on a desktop or laptop computer using the online version of NCLEX Mastery. Each exam version has different questions. This allows you to take a pretest then use the results to create a new study plan. Then, after sufficient studying in your problem areas, you can take the posttest and see the results of your study plan. No, each simulation can be taken once per purchase. Taking an exam more than once may lead to memorization, giving a higher score and a false sense of readiness. We do offer two completely different simulation versions: Pretest and Posttest. This allows you to take two simulations in order to see how much you’ve improved from the first exam version to the second exam version. Yes. The answers and choice-specific rationales can be viewed for each item after the simulation is completed. Read the rationales thoroughly. At the end of each simulation, you will receive time-per-question statistics and a detailed breakdown of your performance across NCLEX Mastery categories. If your time-per-question is less than 45 seconds, consider slowing down to read more thoroughly, and if your time-per question is nearly two minutes, you may be “over thinking” the questions.What does the “Probability of Passing” mean? When you complete the NCLEX simulations you will receive your “Probability of Passing” score. The Probability of Passing is a rough estimate of your chances of passing the NCLEX examination. This is estimated based on an analysis of data collected from a random sample of users who attempted the NCLEX exam in the last 5 years. 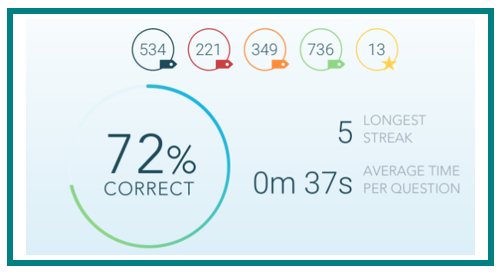 We compared users’ performance in our app to their results on the actual NCLEX exam. This probability of passing (the statistical possibility) estimates performance on the NCLEX exam, but it should not be seen as a prediction of your exam results. It is subject to improvements as we add more data to our analysis. Only you can determine if you have satisfactorily studied the nursing core content needed to be successful on the NCLEX. In the app. 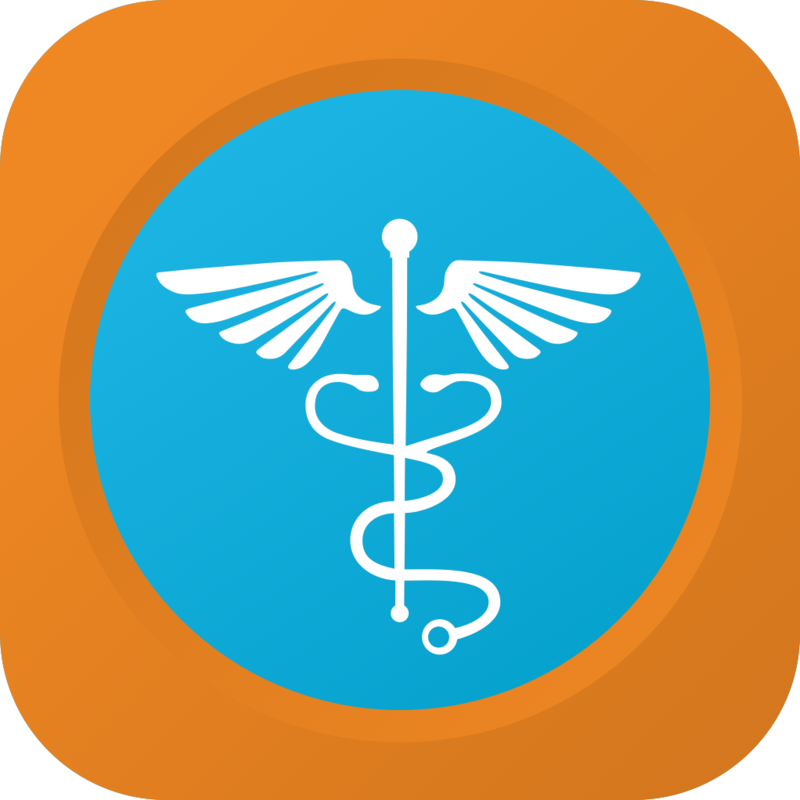 People in the 65% or higher progress range in our app have gone on to pass the NCLEX. So while you may feel that’s “C” level work (or lower!) because of traditional grading metrics, the NCLEX doesn’t work like that. A score of 65% in the NCLEX Mastery application indicates readiness to take the NCLEX simulation. In the simulations – probability of passing (PoP). A probability of passing indicates the likelihood of passing the NCLEX. If your PoP is 80%, then there is an 80% likelihood that you will pass the NCLEX. The questions in the simulations are all written at a high level; in other words, they are TOUGH. Our goal is to make the NCLEX look easy. Use the individual category scores from the simulation report to target areas in the app for studying further. How you interpret your numbers (app score, probability of passing, simulation score) is completely at your discretion. Here are things to consider when determining how ready you feel to take the NCLEX. I am not happy with my numbers on the pretest or in the app. Consider resetting your progress in the application. Complete the questions in the application until you are more comfortable with your knowledge. Then take the posttest NCLEX simulation. My numbers are borderline on the pretest and in the app. Review the questions in the app, focusing on the comprehensive quizzes, category quizzes, and tests. Pay close attention to the areas that your simulation report indicates are weaker. Then take the posttest NCLEX simulation. I am satisfied with my numbers on the simulations and in the app. Spend some time reviewing the areas that your simulation report(s) indicates are weaker and get the NCLEX scheduled! Will the NCLEX Mastery Program help me? Schedule that NCLEX because you are ready! Follow us on Facebook,Twitter,Instagram,Pinterest, and Snapchat. Join our Facebook study group, too! Reach out to us at nursing@hltcorp.com to reach customer success or nursing subject matter experts. Call 319-237-7162 Monday through Friday (8am-6pm CST) to speak to our customer success team. We love talking with our users! Wherever you need to study, we are with you! I took the post test first and recieved a 76% POP should I take the pretest after studying more? Yes. Take one before studying and one after. The pretext will not give you a probability of passing, though.